• Startup: The default working panel, opened when the Gtuner is launched, can be chosen in the "Panel" dropdown list. The Gtuner's toolbar can display text labels below the button icon. In order to display the text label check the correspondent option - the changes will be applied on next program launch. Remember the current session for next launch - If checked, the all the files opened in Compiler panel will be opened again if Gtuner is closed. The Visual Scripting panel can be disabled in case the computer running Gtuner PRO lacks processing power or enough available memory. • Behavior: Some behaviors of Gtuner PRO can be changed by these checkboxes. Automatically open the Device Monitor after a "Build and Run" command, this could be a very welcome behavior while testing and debugging scripts. 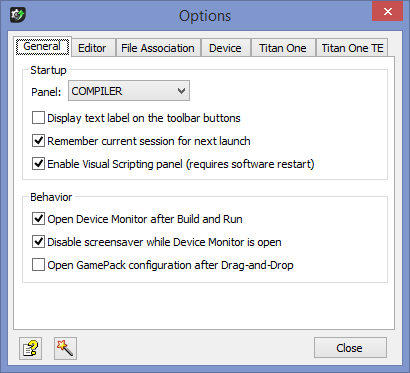 Disable the monitor screen saver when the Device Monitor is open, this is a useful behavior to monitoring a GPC script while playing games. Set the GamePack configuration window to automatically open after dag-and-drop a GamePack to a memory slot. 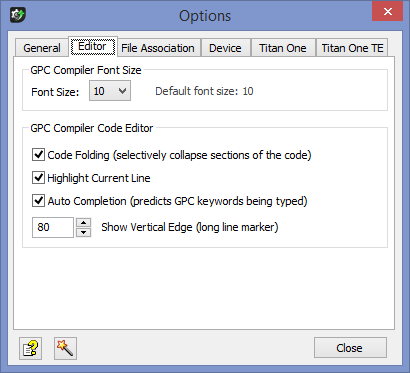 • GPC Compiler Font Size: Font size configuration of the GPC code editor. The default font size is 10. • Code Folding: Gtuner Pro supports so called folding, this means that certain lines of a CPG script code can be hidden based on certain traits. Blocks of code are 'parented' to others and by folding them (collapsing) only the first line is visible. This works well if you want a quick glance at your code and skim for a relevant position. Unfolding the text (a.k.a. Expanding or Uncollapsing) shows the code again. • Highlight Current Line: If checked, the line at which the caret is present will be drawn with a special background color. • Auto Completion: Gtuner Pro has autocompletion capabilities, allowing it to finish a keyword that you are typing by giving a list of possible options based in the GPC scripting language. • Vertical Edge: Draw a vertical edge throughout the document at the distance in columns (as determined by the size of the space character) specified. The value 0 disables this feature. 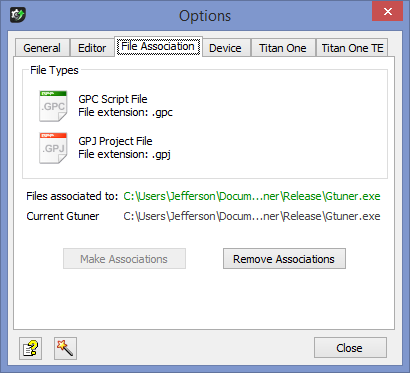 File association associates the GPC files and the GPJ files with the Gtuner software, enabling file actions through double-click, drag and drop, command line calls, COM and DDE. An file association is stored in the windows registry, and can be created by clicking on the button "Make Associations". To reverse the file associations click on the button "Remove Associations".